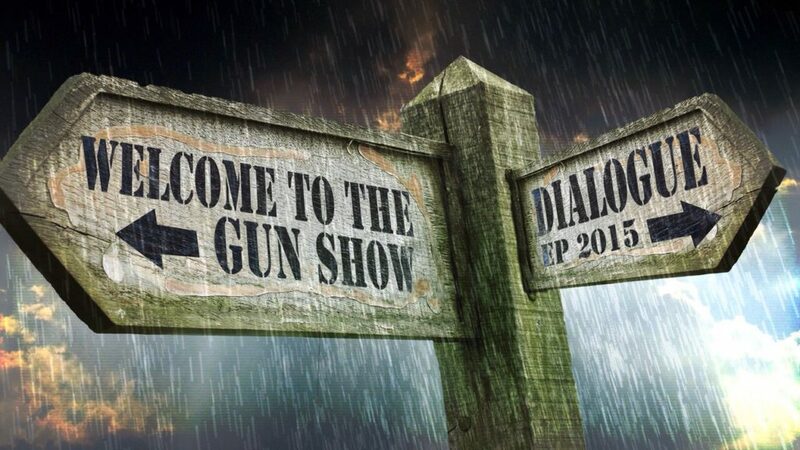 The EP ”Welcome to the gunshow” by Dialogue was recorded in august in 2014. The editing mix and master were done in the following 3 months. Talie, Jeffrey and Dimi had a concept for the writing process of this ep. Every song was inspired by a different band. They came in well rehearsed, had already recorded preproductions themselves and had a good idea of how the EP should sound. We started out with recording the drums. Jeffrey recorded to a clicktrack and used their own preproductions as backing track. Drums were recorded with my usual go-to mics. A large part of the reverbs used on the drums is the natural drumroom reverb. We recorded several samples before recording ( for swapping out some not optimal drumhits if needed). The room reverb of the snare and kick were bounced and then triggered using Drumagog. That gives a very natural room sound, without bleed of for instance the cymbals of the drums. Works very well! For some songs an instance of EAreverb was used for extra ( longer) snare reverb. The middle overhead used on this session was used as mono roommic instead of a real overhead. The bassguitar was triple miced: DI MD441 and e602. For some songs as ”I belong” 2 additional room mics were blend in. In ”I Belong” it’s used in the verses. The guitar was recorded with 3 mics: the sm57 , md421 and BPM CR76. Mostly the SM57 or MD421 was used, depending on the needed sound. Most basic guitar tracks were double recorded too, to use if some fattening up was needed. For the most part we went for 2 different guitar parts on the left and right channel. The vocals of Talie were recorded with the BPM CR76. One of the cool things happening in these sessoins was the creative input during the recording. In the chorusses, the band invited a female singer to add some extra high notes. An extra piano sample during the chorusses added and I felt the guitar solo needed ”more cowbell”. During the recording, we added more vocals in the chorusses then orginally intended. We were getting a nice Alice in Chains vibe here and decided to add an extra Vocal Chorus right at the beginning of the track. We ended up adding extra vocals in the breakdown too. Nothing special was added, these worked fine as they were written. Alienated was the first finished mixing and was the benchmark soundwise for the rest of the mixes. This track has a Tool or Perfect Circle vibe going on. The vocals even were a bit ”James Maynard Keenan”. This is way we went for a type of question answer telephone effect in the second verse. The detuned guitar in the background happened during recording too. We were tinkering with delay settings and the detuning happening at that moment we liked so much, we kept it.